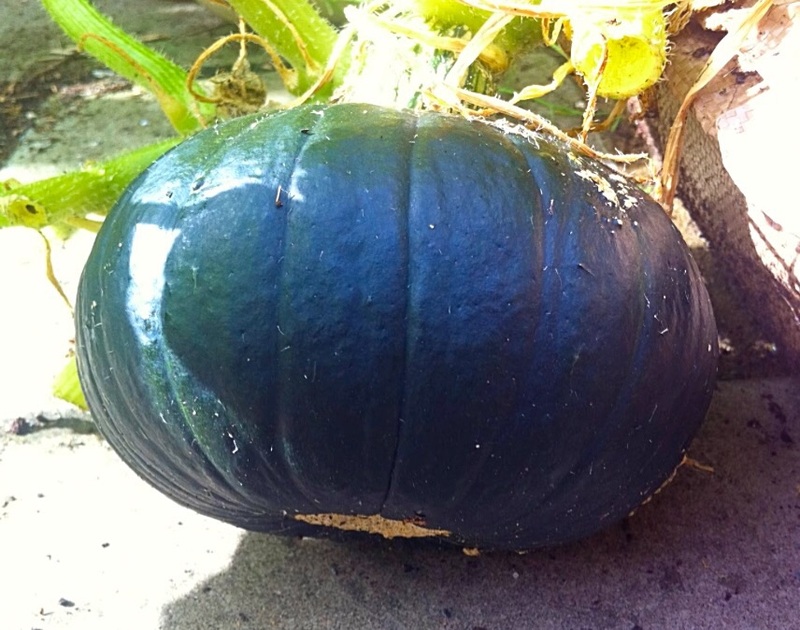 One of my favourite veg to grow has to be squash and pumpkin. To be honest, I love them all, from summer squash ‘Patty Pan’ to great winter keepers like ‘Honey Boat’. 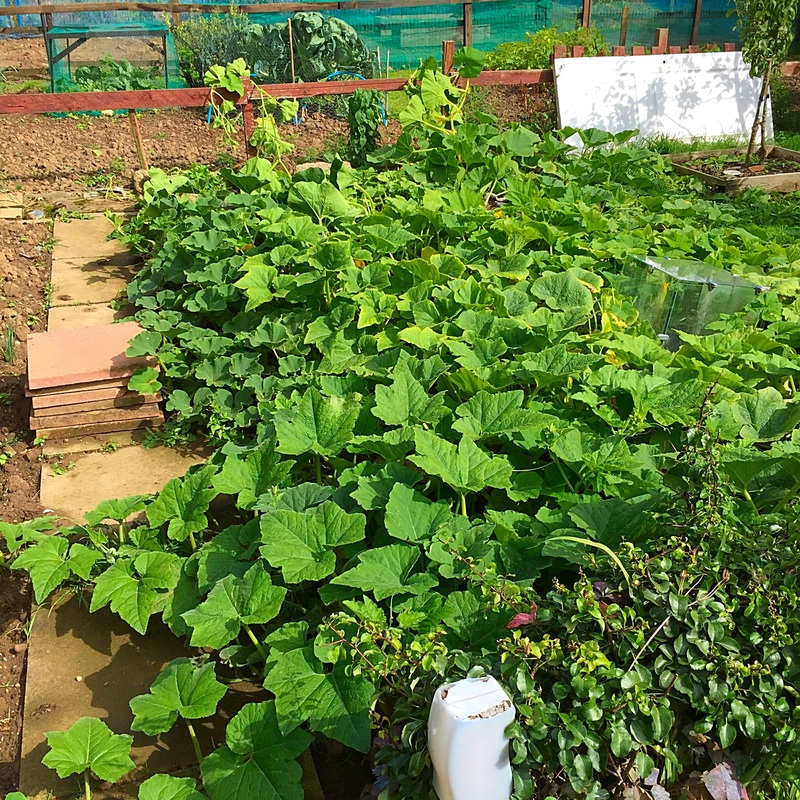 As long as you give them plenty of manure and water, squash will keep the weeds at bay and need very little attention, perfect if you can’t visit the plot every day! Summer squash are the varieties that keep cropping throughout the summer (hopefully, when it’s not vile weather) and you have to keep picking to keep on top of them. We’ve all grown a courgette, or squash that should be picked small and sweet and accidental left it on the plant only to find a Ford Fiesta size whopper the next time we looked! Winter squash on the other hand, are varieties which you don’t pick. You leave them on the plant until before the first frosts, then snip them off for long term storage. These are the squash I admire the most, they’re able to last for months in the garage without refrigeration and are still superb when used in the new year. In fact, some of these varieties get sweeter with age (don’t we all…) and are better used after a couple of months of storage. As you all probably know, I love my heritage vegetable varieties, especially something a bit different. That’s why I’ve not grown any big standard courgettes this year. Don’t get me wrong, I like them, I just wanted to see if there was an alternative which would be better to grow. I was given some ‘Tromba of Albenga’ seeds by a friend. They form long snake like ‘courgettes’ which normally curl into a loop and have a bulbous end. 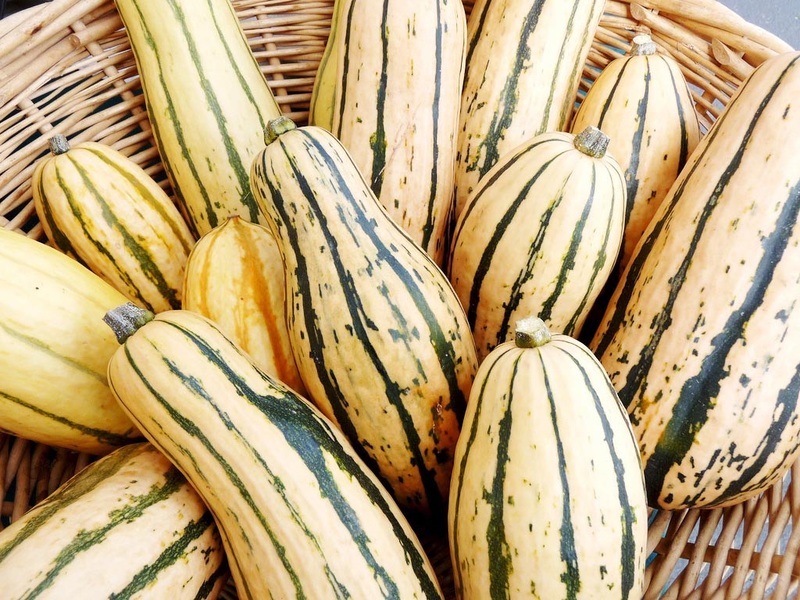 I love this variety because there are no seeds in the entire length of the fruit (apart from the very end bulbous part), so you have firm and tasty flesh to use which keeps it shape when cooked, unlike traditional courgette which go to mush. I use the fruit in exactly the same way as a normal courgette, however I find it has more taste and is defiantly better to cook with as its firmer. I have even chopped it into chunks and roasted it, it stays just as you left it and is gorgeous! These aren’t little plants, I have a large patch of my plot given over to squash and it fills up with plants every year. This one sprawls and climbs, so perhaps training it up posts and wires in front of the shed would be an idea next year, although it’s easy to keep under control if you keep snipping the ends off the runners. Another variety I always like to grow is ‘Honey Boat’. 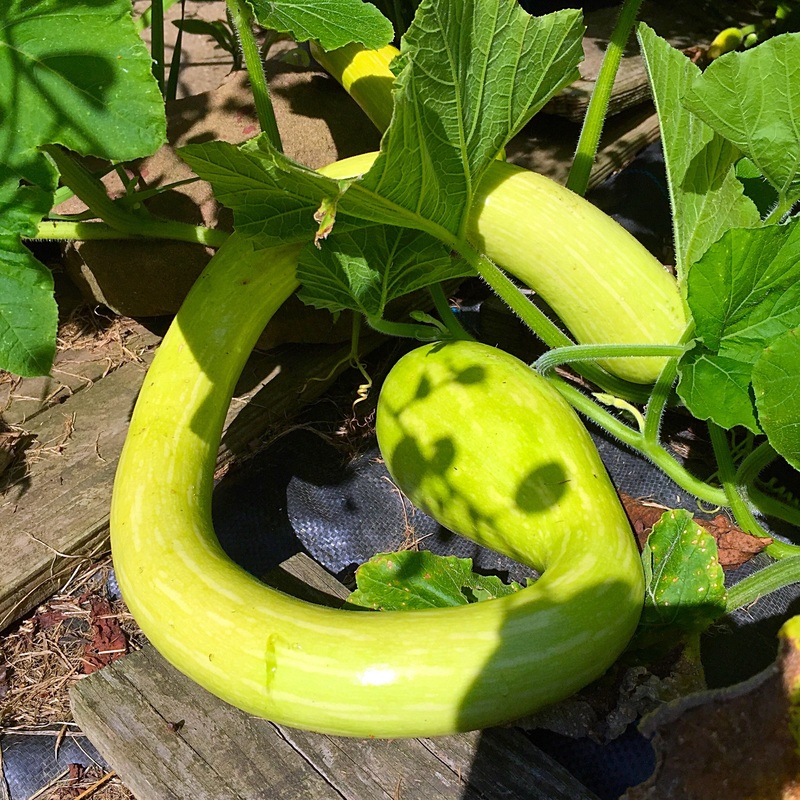 This squash is a winter variety, growing all summer and producing lots of 6-8inch long squash that will keep for months and are ideal for 2 people. I originally found this variety in California about 8 years ago and I’ve been growing and saving my own seeds from the plants ever since. As far as I can tell, no one sells this super squash in the UK….YET! The fruits from the ‘Honey Boat’ not only look attractive, they have really sweet orange flesh, sweeter than a ‘Crown Prince’ or ‘Butternut’. They also has a fantastic in build best before date! The green stripes on the fruit fades with age, so you know which ones you need to eat first when they are in storage. Just go for the one that’s got fainter stripes, then you know the remaining squash will last longer, how ingenious is that! ‘Honey Boat’ are the ideal size for 2 people. I chop them in half, scoop out the seeds (saving the biggest for next years crop) then I drizzle with olive oil and pepper, stick them in the oven and roast until tender. You can eat the skin once it’s cooked, it goes like the chewy skin on a jacket potato. This variety is that sweet, you only need to add a couple of making pumpkin soup, use a more mainstream variety to make up the rest of the ingredients, unless you have a sweet tooth. Over all, I’d say that ‘Honey Boat’ would be the variety I would grow if I was only allowed one squash on my plot. Super productive, super keeper and super sweet! I’m also growing a couple heritage varieties from the Heritage Seed Library, they should make a great talking point on the plot and give enough seed to let all my gardening buddies have a go at growing them next year. Zapallito de Toscana, Smells like melon but has a more savoury flavour. A bush variety that reliably produces tennis ball- sized, dark green to purple fruits with orange flesh for summer or winter use, as it eventually develops a hard, waxy rind,excellent keeper. However mine are like footballs already, so I’ll have to see what they taste like. I must admit, they were the easiest and quickest squash to germinate! Shishigatani is another pumpkin I’m trying this year. This Japanese pumpkin was developed in the early 19th century. 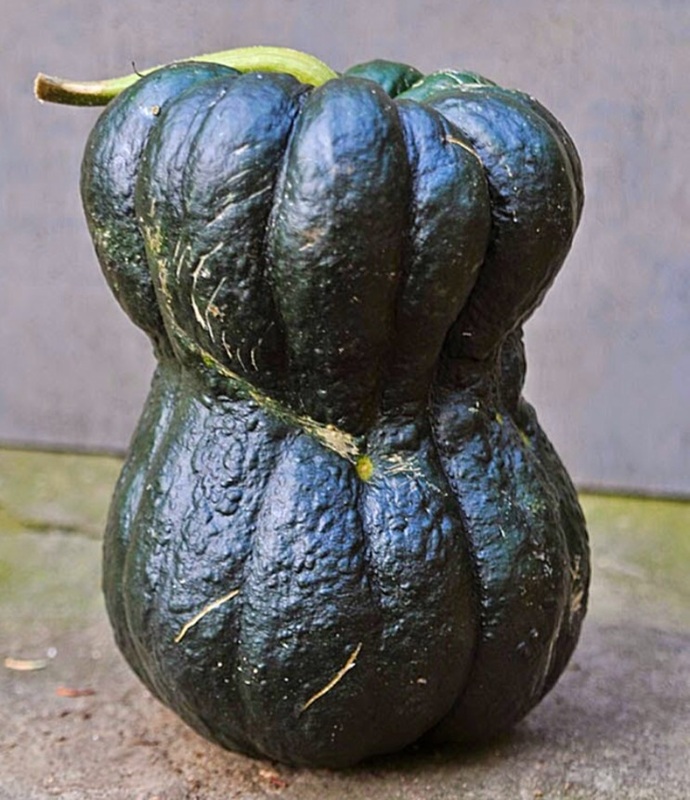 It is bottle-gourd shaped and has ribbed, very warty dark green skin, which turns tan when fully mature. Its fine-grained, yellow flesh has a delicious nutty flavour. Next year I’ll be growing some more squash from around the world, so I’ll keep you updated on the progress and the taste. In the mean time, try and make space to grow one yourself, they are so versatile, you’ll be glad you did!